Six of the seven women who completed our first bank teller training class were able to attend the graduation celebration. 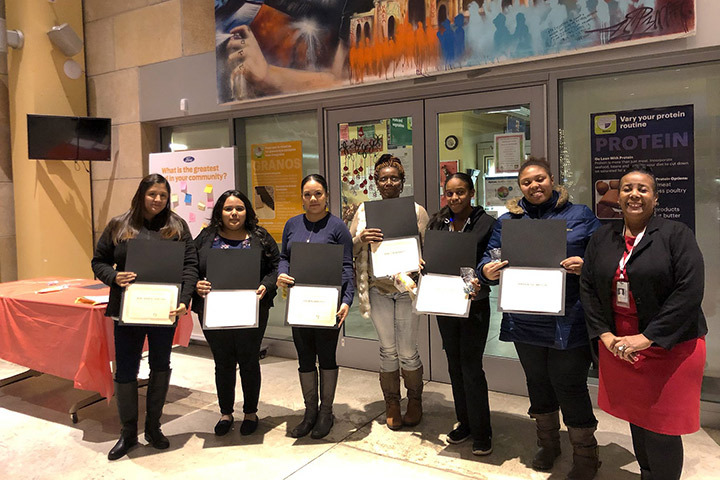 From left to right: graduate Jeimi Sanchez, graduate Yesenia Arroyo, graduate Yasmin Arroyo, graduate Shacon Bennett, graduate Charnella Walker, graduate Jemeka Thompson, and instructor (with Southwest Solutions) Rosetta Kincaid. Seven women celebrated completing our 8-week bank teller training course. There’s a good demand for bank tellers, and the job is a good opportunity to start a career in financial services. Participants in the free program learn about the various responsibilities of a bank teller, customer service, job etiquette, interviewing and resume-making skills to obtain a job, and more. The program provides bus tickets and a stipend to participants. Our next bank teller training class will start in January. To learn more and to enroll, call 313-451-8055. Our bank teller training program is sponsored by UnidosUS and the W.K. Kellogg Foundation. See photos on more information in the Facebook story.